Due to their overwhelming success, the Bluekin Pop Tarts are now safely sequestered in the freezer so that they don’t meet their fate early. I don’t need to carry them around with me on each hip this week or anywhere else for that matter. Besides the baking, I had a very successful weekend and got a lot done. 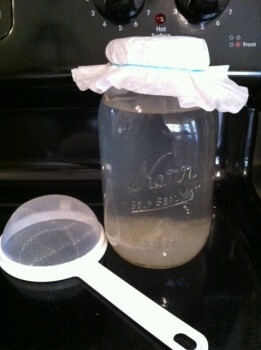 I started a batch of water kefir for the first time. I’ve had milk kefir that I’ve purchased at the store and really like that a lot. I use it to make my protein shakes and like it as much as yogurt to eat plain. I’ve never tried water kefir before so I’m not sure what to expect. So why on earth would I make water kefir? Because I’m unique like that. No, seriously. 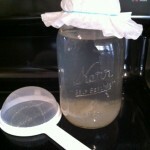 I’ve read a lot about kefir and the benefits of the probiotics to aid in health and digestion. Since I don’t need the extra calories from milk kefir and The Kid is allergic to dairy, water kefir seemed the perfect choice. I also saw that it’s a healthier alternative to soda because it carbonates slightly during fermentation. I’m hoping to provide something to The Kid that is simple and cheap to make and will replace soda and juice for her. You can make all kinds of flavors of this stuff so I’ll be experimenting a bit. Cherry vanilla sounds really good! I also have cultures now to make our own soymilk yogurt. The Kid goes through that like it’s going outta style. If I can make my own, I’ll save a small fortune. Have you tried water kefir before? Did you like it or am I going to be disappointed in this venture? Dying to know.